Born in Tallinn, Michel Sittow, studied in the studio of his father Clawes van der Sittow, a respected painter and wood carver. 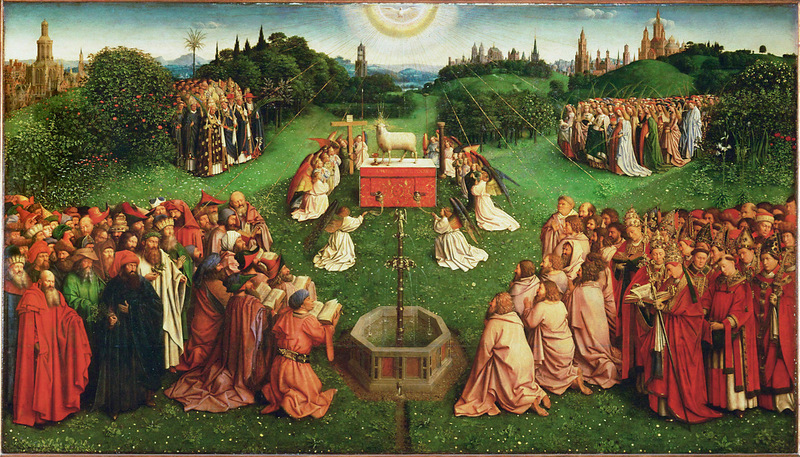 In 1484, the young artist headed to Bruges, the art centre of the Netherlands at the time, probably to work in the studio of Hans Memling, a German who was the town’s most sought-after master. There he learned the illusionist technique typical of the Netherlandish school of painting. From 1492 to 1504, Michel Sittow was in the service of Isabella of Castile, and later worked as a portraitist for Philip the Handsome, Margaret of Austria, Ferdinand of Aragon and Christian II of Denmark. Sittow returned to his home-town of Tallinn, first in 1506 in connection with an inheritance dispute, when he joined the local artists’ guild. In 1514, Sittow left for Copenhagen at the invitation of King Christian II, and from there he went on to Spain and the Netherlands. The famous portraitist returned to Tallinn for good in early 1518. With his diverse heritage (a family with German and Finnish-Swedish roots living in Tallinn) and cosmopolitan career, Sittow did not fit in with the national narrative of art history that prevailed in the first half of the 20th century. However, his cosmopolitan career is all the more relevant in the current European context. The international exhibition project, which includes multi-faceted collaboration with centres in Europe and the United States, brings Sittow’s extraordinary works from distinguished museums and private collection to his first solo exhibition. This is a unique platform for a broader introduction and further research on the oeuvre of this remarkable artist. Most of Sittow’s small number of works (20 to 25 paintings) are on exhibit, thereby providing an excellent survey of his work as a portraitist and painter of religious works. It also allows us to view his art in a broader context, including in collaboration with Juan de Flandes and other contemporary Netherlandish artists. In addition to the paintings, another section of the exhibition is comprised of a timeline that provides an overview of the 500-year story of Michel Sittow, from his birth and successful career to his fall into oblivion and rediscovery. The exhibition, which is a collaborative project of the Art Museum of Estonia and the National Gallery of Art in Washington, DC, will take place in 2018 in celebration of the centenary of the Republic of Estonia. This year also marks 500 years since Michel Sittow’s final return to his home-town of Tallinn. This entry was posted in Exhibition, Uncategorized and tagged 15th Century, 16th Century, Aragón, art, Bruges, Castile, christian II of denmark, estonia, Exhibition, ferdinand of aragon, Iberia, Isabella of Castile, KUMU museum, Margaret of Austria, Michel Sittow, national gallery of art DC, Netherlands, Painting, Philip the Handsome, Portraits, Renaissance, Spain, tallinn, usa on June 26, 2018 by costanzabeltrami. On 9 and 10 February 2017 an international conference will be held on the copies of paintings of Flemish masters during the sixteenth and the seventeenth centuries related to the Hispanic world. The event will take place at the Royal Institute for Cultural Heritage (KIK-IRPA) in Brussels and is organized in collaboration with the Spanish National Research Project COPIMONARCH: La copia pictórica en la Monarquía Hispánica, siglos XVI-XVIII (I+D HAR2014-52061-P) from the Universidad de Granada. The artistic heritage of the regions that once formed part of the former Spanish Empire includes a large number of painted copies after Flemish masters made during the sixteenth and the seventeenth centuries. Most of these works have received little attention even though they constitute a valuable source for understanding the artistic influence of the Southern Netherlands on Spanish and Latin American art and society in this period. Indeed, the study of copies of Flemish masters sheds light on a number of art historical issues, including the means of diffusion of artistic models, stylistic trends and the dynamics of the art market and the world of collecting. These copies are a valuable testimony to the political, commercial and cultural ties that existed between the Hispanic territories and the Southern Netherlands. The conference will focus on the phenomenon of the copy from a large variety of approaches, ranging from workshop practices to collecting, trade and patronage. Papers about studies on particular copies are welcomed, but special attention will be paid to the driving forces behind the export-driven market of copies, such as artists, patrons, collectors and merchants. By taking into account cultural, religious, political and socio-economic dynamics, this conference aims to shed new light on the multifaceted artistic impact of the Southern Netherlands on the Hispanic world during the sixteenth and seventeenth centuries. We welcome 20 minutes papers that offer new contributions in which recent methodologies and theoretical frameworks are applied to copies after Flemish masters from this period. Proposals can focus both on copies made in the Southern Netherlands to be sent to the Iberian Peninsula and Latin America, and on copies made in these regions. Candidates are invited to submit their proposals to Eduardo Lamas-Delgado (eduardo.lamas@kikirpa.be) and to the project COPIMONARCH (copimonarch@gmail.com) before 15 September 2016. This should include an abstract (up to 300 words) and a brief CV (max. 1 page). The conference organisers are unable to cover travel and accommodation costs for speakers. Interested parties should apply for support from their respective institutions. Elena Alcalá (UAM, Madrid), Christina Ceulemans (KIK-IRPA, Brussels), Maria Cruz de Carlos (Museo Nacional del Prado, Madrid), Christina Currie (KIK-IRPA, Brussels), Hélène Dubois (Ghent University / KIK-IRPA, Brussels), Pedro Flor (UAB, Lisbon), Bart Fransen (KIK-IRPA, Brussels), David García-Cueto (UGR, Granada), Pierre-Yves Kairis (KIK-IRPA, Brussels), Eduardo Lamas-Delgado (KIK-IRPA / ULB, Brussels), Didier Martens (ULB, Brussels), Benito Navarrete (UAH, Alcalá de Henares). This entry was posted in 2017, Call for Papers, Conference, Latin America, Madrid, Prado, Seminar, Spain, Spanish Art, Symposium and tagged 2016, 2017, KIK-IRPA Royal Institute for Cultural Heritage Brussels, Latin America, Madrid, Netherlands, Prado, siglos XVI-XVIII, Spain, Spanish, Spanish Art, Spanish Royal Collections, Symposium, University of Granada on June 21, 2016 by M. Ellis.